This is a photo of our late grandfather John George Jolly with his daughter Thora Jolly nee Sinclair. The gentleman at the back is Jacky Watters. In the background is Jolly's shop which is now the Harray Stores. 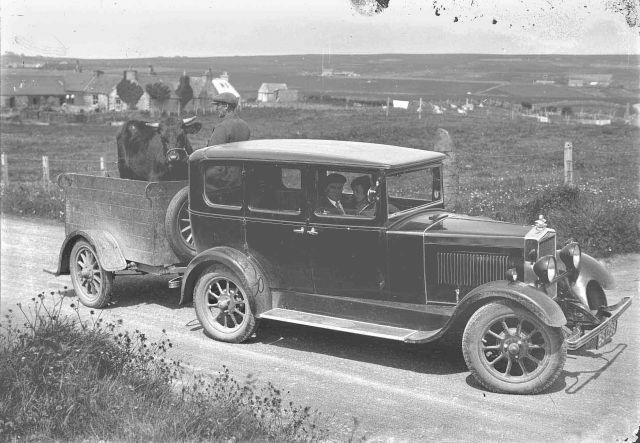 I have been told that the car trailer is the first one in Orkney. The year this photo was taken was 1930. This is the first I have seen of this photograph. I mind John George fine. I visited him at Madras Cottage many times. John George was my great uncle. I also mind Thora and John Sinclair. He cut my hair many times. I had a nice yarn with Thora up in Glaitness Road a couple of years before her death.